Prentiss Wickline Architects and Balance Associates Architects have combined. At the core of both firms is the pursuit of balance: between natural and built environments, between a client’s vision and real world parameters, between beauty and utility. This house was designed as a second home for a Bay Area couple as a summer retreat to spend the warm summer months away from the fog in San Francisco. Built on a steep slope and a narrow lot, this 4000 square foot home is spread over 3 floors, with the master, guest and kids bedroom on the ground floor, and living spaces on the upper floor to take advantage of the views. Tacoma Art Museum celebrated a groundbreaking ceremony with some 300 supporters and the community to kick off the museum’s transformative building expansion project. Construction begins in late October on the approximately 16,000 square foot new wing and building renovation. The new wing will provide a home for the Haub Family Collection of Western American Art, double the museum’s gallery space, provide greater art e xperiences for visitors, and increase the museum’s role in downtown Tacoma. 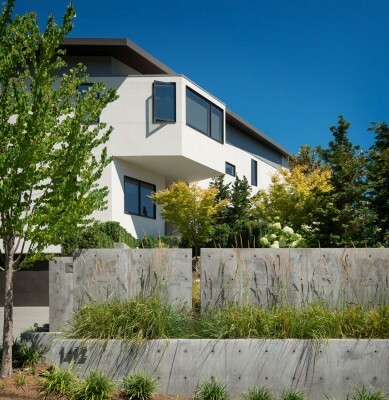 Award – winning architects Olson Kundig Architects will design the expansion and renovation. Wolf Creek View Cabin sits in a lightly treed meadow, surrounded by foothills and mountains in Eastern Washington. The home is designed as two interlocking “L’s”. A covered patio is located at the intersection of one “L,” offering a protected place to sit while enjoying sweeping views of the valley. A lighter screening “L” creates a courtyard that provides shelter from seasonal winds and an intimate space with privacy from neighboring houses. With a compact form and several integrated sustainable systems, this residence achieves the client’s goals to maximize the site’s views and resources while responding to its microclimate. The roof rainwater collects into a steel entry water feature, day light penetrates deep into the house through a central translucent slot, and exterior mounted mechanical shades can prevent excessive heat gain. On Sunday, March 24, the Seattle Art Museum (SAM) will unveil MIRROR, a permanent art installation for the façade of SAM by artist Doug Aitken that will become a new landmark in downtown Seattle. The Olympic Sculpture Park has transformed a nine-acre industrial site into open and vibrant green space for art. This new waterfront park gives Seattle residents and visitors the opportunity to experience a variety of sculpture in an outdoor setting, while enjoying the incredible views and beauty of the Olympic Mountains and Puget Sound. This Seattle home inhabits what was one of the last unoccupied slips. The Seattle Houseboat and Float Home community is unique: the residents share access and live in close proximity to one another, yet there is a community diversity that is unrivalled. Some of this stems from the fact that the community was not developed at any one time, while some can be attributed to the immensity of style that adorns these Seattle homes (you don’t see a ton of fabric architecture here). UW Medicine’s South Lake Union development is a multi-phase design and construction project that supports the UW’s internationally renowned biomedical research efforts. Located on the adjacent west block of UW Medicine’s existing South Lake Union research complex, Phase Three will include up to three buildings totaling nearly 542,000 square feet of laboratory and office space, and 47,250 square feet of outdoor space.